Dancing in the street, water balloons whizzing past your head, people covered head to toe in a rainbow cloud of colors — if that’s what comes to mind when you think of the Festival of Colors, you’re not wrong. But there’s so much more to Holi than meets the eye. For example, the literal meaning of Holi is 'burning', and the legend behind its name involves a demon king and blazing fires. Have we piqued your interest yet? 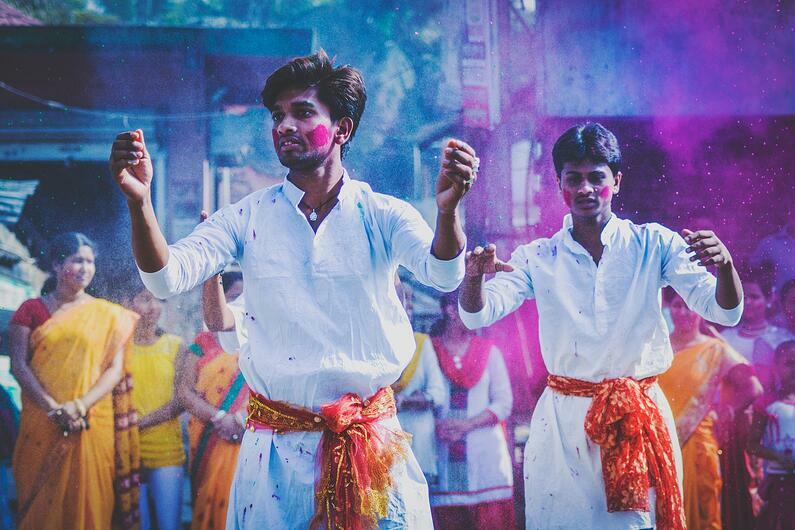 If you’ve always loved the idea of Holi, you should know what it’s really all about. Let’s start with the basics. A traditionally Hindu festival, Holi has gained popularity around the globe as a celebration of spring’s arrival. Most popular in India and Nepal, Holi is celebrated for two days, beginning on the full moon of March, called Purnima [Full Moon Day]. The whole festival is rooted in celebrating the triumph of good over bad, and we’ll get to the reason why later. Holi is all about destroying your inner evils, repairing broken relationships, and celebrating goodness. On the second day of Holi celebrations (known as Rangwali Holi), people take to the streets for the festival of colors, showering everyone they encounter in colored powder and water. It’s wild, vibrant, and a total free-for-all. Let’s go back to the beginning — all the way back. There is evidence of Holi celebrations taking place several centuries before common era, although it has changed significantly over time. Historians have found reference to Holi depicted in paintings on the walls of ancient temples of medieval India, showing people dancing around a pool of colored water. While legends vary, the most popular understanding of Holi’s origins centers around Hiranyakashyap, the demon king Asura [a lord or a demigod] from the Puranic scriptures of Hinduism. As the story goes, Hiranyakashyap was a king who continually thirsted for more power. In his arrogance, he became fixated on gaining more worshippers, hoping that someday everyone would worship him. When he finds out that his own son, Prahlad, is a devoted worshipper to a different god, Lord Naarayana, he is livid. The king’s sister, Holika (sound familiar? ), has a special power that allows her to survive fires without getting hurt. Knowing this, Hiranyakashyap commands her to take Prahlad with her into a fire, where he would perish and she would survive. As it turns out, her power only works if she is in the fire alone — Holika dies for her evil deed, and Prahlad is saved by a god for his devotion. 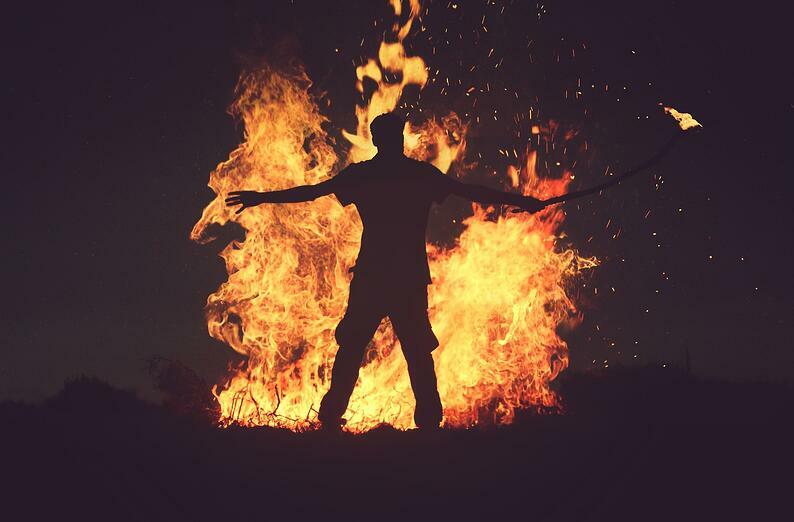 To this day, many people burn a Holika bonfire the evening of the first day of Holi, where they gather around the bonfire and pray for their inner evils to be burned in the fire. Why do people throw colors during Holi? 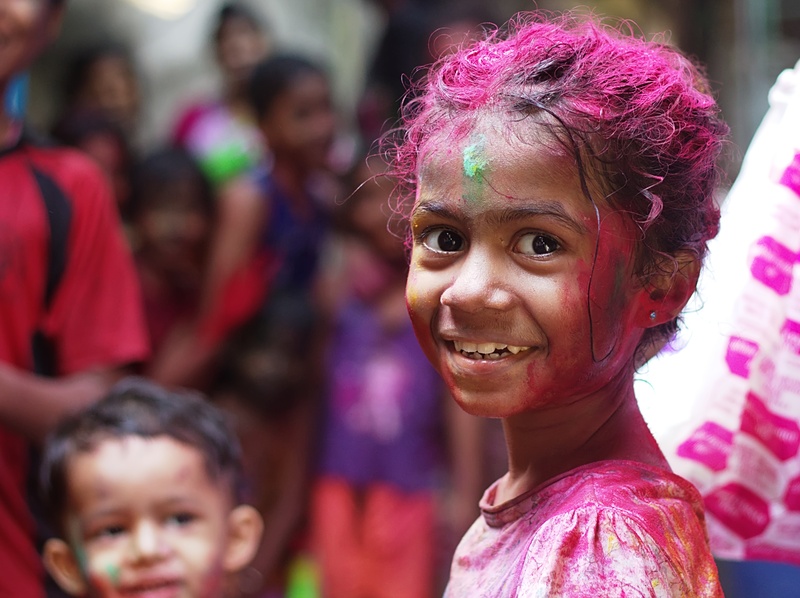 Now that we understand the origins of Holi, you might be wondering where the festival of colors comes into all of this. The all-day color carnival is actually a reenactment of a ritual that the Hindu god Lord Krishna did with the Hindu goddess Radha and other gopis [milk maids]. 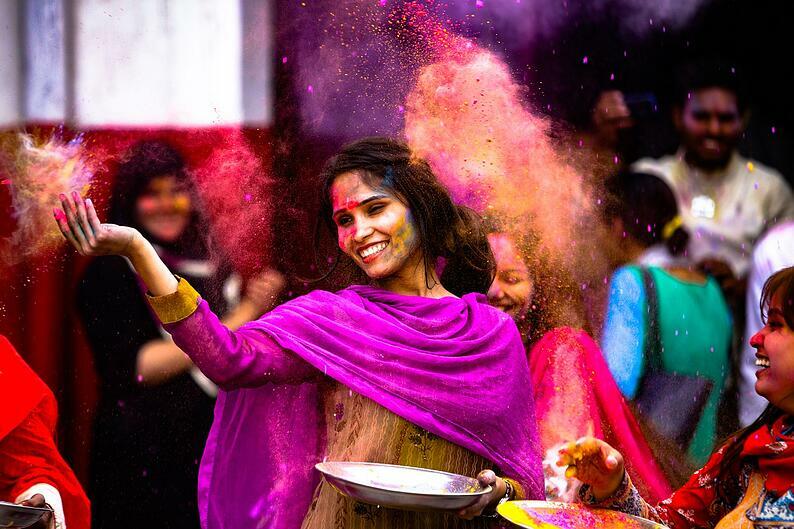 Their light-hearted, flirtatious game inspired the festival of colors now celebrated on Holi. 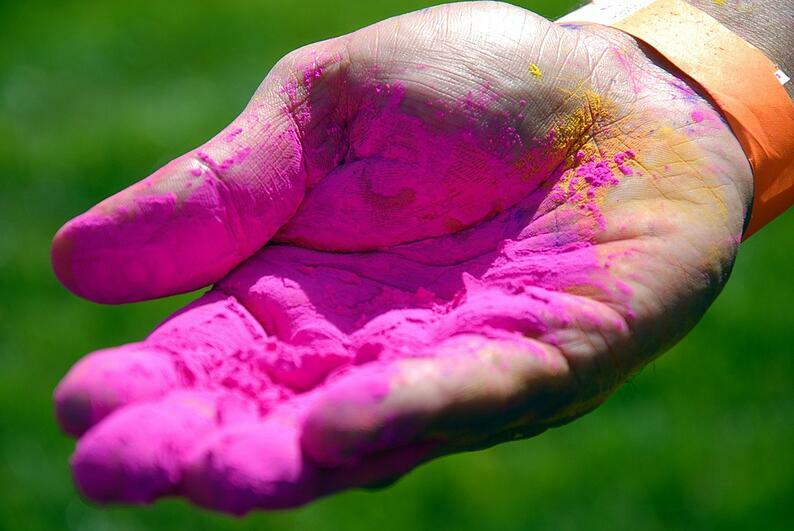 Originally, the colors used in Holi were made from natural sources, like herbs and flowers. Today, the fluorescent blues, yellows, reds, and greens are usually synthetic, and they’re spread with water balloons, super soakers, or just by smearing it on others with your hands. Today, Holi is one of the most vibrant celebrations in the world. Throngs of people dance in the streets to popular Holi songs and live music, there is food and drink at every turn, and no one is safe from the shower of colors being shared in celebration of the arrival of spring and goodness. After a wild day, families and friends gather in the evening to exchange gifts, share a meal, and spend time with one another. Just remember: it’ll probably take you a couple of days to wash the colorful dyes from your hair, clothes, and skin — it’s all a part of the fun. Ready to add a little color to your life? Mango's courses are packed with bright colors and language learning that can take you anywhere. Start learning today! Are there any fun festivals in your area that you love celebrating each year? Feel free to let us know in the comments below!